Melissa Howell expected to lose weight when she joined Precision Nutrition Coaching. And she did lose — an impressive 55 pounds — just in time for her wedding. A loser? That’s tough to believe of a former Division One basketball player and graduate of San Francisco’s prestigious Academy of Art University. “Okay, so I was a winner in love,” she concedes. After all, she’d had the luck to find (and the good sense to choose) a guy who understood her and who loved her for the person she was. There was just one little problem. She didn’t love herself. Not only that, but the universe didn’t seem to like her all that well, either. Take her professional life. Despite having considerable artistic skill and a fancy degree to prove it, Melissa had searched for almost a year before she’d been able to find a job in her field. That wasn’t all. She was also overweight. Actually, it was worse than that. She was almost officially obese. Melissa in Las Vegas, before starting Precision Nutrition Coaching. Once, Melissa had been lean and fit. She could clean 150 pounds and run up and down a basketball court for hours. Now, at age 31, she could barely finish a mile in 10 minutes. Yet she felt powerless to do anything about it. So they took up Muay Thai at a place nearby her work. The classes were fun, and Melissa felt a little better about herself. Just putting in some effort felt like progress. Still, the numbers on the scale weren’t improving a whole lot. And sometimes she wondered if things would ever change. Was this it? Was this the best she could expect of life? Then, one miraculous week in June of 2011, her fortunes shifted. First, on a tip from a friend, Melissa applied for and landed a much better (and better-paying) job. The company, called Playdom, creates those addictive little social media games that alleviate boredom during long workdays. Yes, she’d still be designing kitsch. But now she’d be working digitally. She could be a bit more creative. There was room for upward movement in the company. And the perks were great — free passes to Disney. Her dog days were over. Things were looking up. She started work on a Monday. Then, on Wednesday, she noticed an email from Precision Nutrition, inviting her to join the Precision Nutrition Coaching presale list. Melissa wasn’t a newcomer to PN; back in 2007, she’d actually bought a copy of the PN System. She had even signed up for Precision Nutrition Coaching in 2008. But at the time — still a student, with a part-time job and other responsibilities as well as a thesis to complete — she wasn’t really in a position to follow through. The book had gathered dust on her shelf, and she’d withdrawn from the program because she felt she couldn’t afford it. Now, with this new job, she had the money, she realized. Her financial position didn’t have to hold her back. She also had an important motivation. Because on Friday of that fateful week, following a dinner at their favorite restaurant, Melissa’s boyfriend, Derek, asked her to marry him. Right there, next to their table, he got down on his knee and proposed. The waiters brought champagne and snapped photos. Later, looking at those pictures, Melissa realized that her image wasn’t a match for the way she was feeling inside. And she knew the time had come to commit to Precision Nutrition Coaching. By her wedding day, she wanted to look like the happy person she was starting to become. Melissa’s wedding day dreams did come true. That’s what Melissa advises now. It’s one reason she believes she was successful in the program. But, as much as she focused on outward changes in the beginning — losing enough weight and getting fit enough to look fantastic for her wedding day — it wasn’t long before she realized that her coaching journey would be about a whole lot more than that. She was juggling a lot — new job, new living arrangements, wedding plans, new nutrition and exercise routines. Yet instead of buckling under the strain as she might have done in the past, instead of over-eating to cope, she was stretching herself to meet these new challenges. “It’s not just about what you see in the mirror, it’s what you feel inside,” she says. And what she felt inside was enthusiastic, determined, hopeful — and proud. Proud of her effort. Proud of her results. It had been a long time since she’d felt like that. 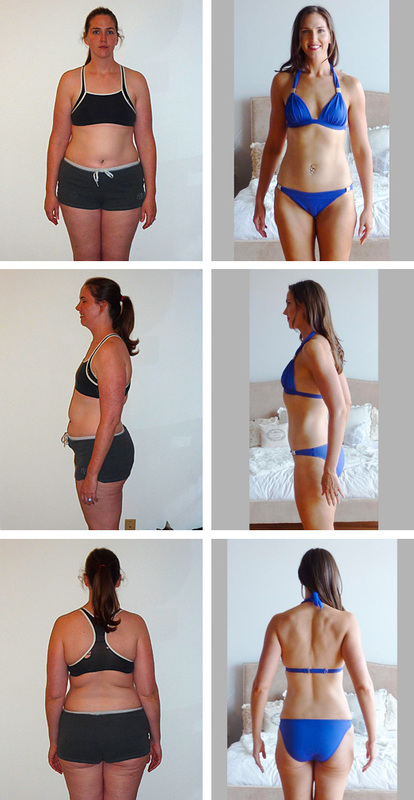 Six months into Precision Nutrition Coaching and Melissa had lost a respectable 33 pounds. By April, she was down 51 pounds, and it was obvious that the dress would have to be taken in a couple of inches along the sides. Not only that, but she’d lost a full ring size. Her engagement ring would have to be resized. Luckily, there was still plenty of time to make those changes. Looking at her progress photos, Melissa could hardly believe her eyes. What had made this possible? It wasn’t the exercise — although the exercise was great. It made her endorphins sing and helped her mood and energy levels. But more than that, Melissa knew, Precision Nutrition Coaching had changed her relationship to food. Listen to that: To make me feel worse. To make me feel worse? Melissa had been using food to confirm her negative opinion of herself. But now, she felt good about herself. Her need to comfort herself and punish herself with food had disappeared. What’s more, she had learned that even self-confessed health nuts can enjoy the occasional indulgence. Now, thanks to Precision Nutrition Coaching, she could eat her chosen treats without guilt, without remorse. “I can be done at one cookie instead of at four, and guess what, I can be fine without one!” she wrote. By May, 2011, not only had Melissa lost a lot of weight, but she’d also done a lot of thinking about her goals and values. It surprised her how deep into her head some of the lessons got. Through Precision Nutrition Coaching, she had regained her inner athlete. But what amazed her more was the way the program had affirmed her identity as an artist. She’d come to recognize that she was an athlete and an artist. Not one or the other, but both. As a result, Melissa undertook the unusual step of changing her screen name to reflect her new sense of herself: Arthlete. And in designing a logo for her Precision Nutrition Coaching team, she cemented that identity. Capturing the “life is awesome” feeling, at Melissa’s photo shoot. Today, Melissa is worlds away from the angry and frustrated person she was when she began the program. “Now I’m confident. I enjoy movement. I love good, clean, whole food. I enjoy cooking and clothes shopping,” she says. She’s also paying it forward, serving as a valued mentor for a new cohort of Precision Nutrition Coaching clients, and studying for her PN Certification. “I plan to start some sort of fitness program here at my office (there’s a gym in the building) and perhaps take on some private clients as well,” she says. It’s always good to have an end to journey toward, but it’s the journey that matters, in the end, Melissa wrote in her journal, quoting the writer, Ursula K. LeGuin. Freshly home from her honeymoon, she cracks an enormous smile. Melissa and her husband hiking Mount Tam on their honeymoon. Want to read more great stories like Melissa’s? Then come meet a few other men, women, and couples who lost weight, started eating better, and took control of their health.